As a user you should read and understand the medicines label before taking the medication as prescribed. The right use of medicines according to doctor’s instructions and advice provided by the pharmacist is important to ensure an effective and safe treatment. Label on the medication envelope comprises important information about how to take medication correctly and safely. .Therefore, it is crucial to read and understand the label on the medication envelope to prevent medication errors. Medication errors can be avoided if the medications label are carefully read and understood. Users are encouraged to learn the actual name of the medication instead of trade names to avoid confusion. But there are still many who do not understand and confused about this issues. The name of a medication known as generic name is the chemical name or the name of the active ingredient of the medication. This name is applicable worldwide. For example ‘Paracetamol’ is a generic name of the medication, trade name / brand name is the name given by the manufacturer of the drugs and it varies from one manufacturer to another. Consumers have the right to know the name of the medication prescribed or supplied to them. Always request for the generic name to be written on the label of their medication. Medication should be taken correctly to obtain the optimum effect and minimise any undesirable adverse effects of the medication. Patient are advised to taking the medicine in accordance with the instructions written on the label of medication envelope. Therefore, the instruction on how to the medication is very important and must be written clearly on the envelope. The purpose of taking medication before meals is to prevent interactions between food and drugs. In addition, it also increases the absorption of the drug if it is taken on an empty stomach, which means 2 hours before food. Example:Bisacodyl, Perindopril, Iron Tablet, etc. Some medicines may irritate out stomach. Therefore, taking medicine after food can prevent stomach irritation/discomfort. Example of medicines should be taken with full stomach, which means 2 hours within meals Example: Mefenamic acid, Ranitidine, etc. Some medicines can be taken with or without food. Example: Paracetamol medication, Chorpheniramine etc. The purpose of taking medication with food is to enhance the effects and promote a more effective absorption of the medication. These medications should be tken together with first mouth of food. Examples: Acarbose, Calcium Carbonate etc. 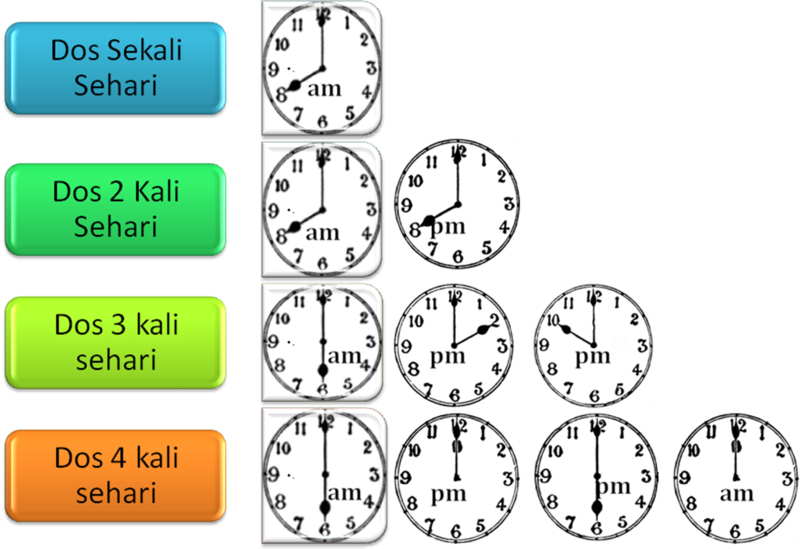 Some medications have optimal effect if taken at night. Example: Simvastatin should be taken at night because of increased cholesterol synthesis at night. This instruction is given to type of medications that should be taken if there is only a symptom or disease. Example: Paracetamol, Mefenamic acid etc. According with the provisions of existing law (the Poisons Act 1952) all medications that are sold or supplied must have the label “Controlled Drugs / Controlled Medicine”. 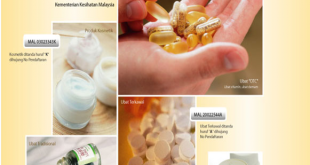 The label “For External Use / For External Use Only” must also be present for the medications that are sold or supplied for external use such as lotions and creams in Bahasa Malaysia, English, Chinese and Tamil. 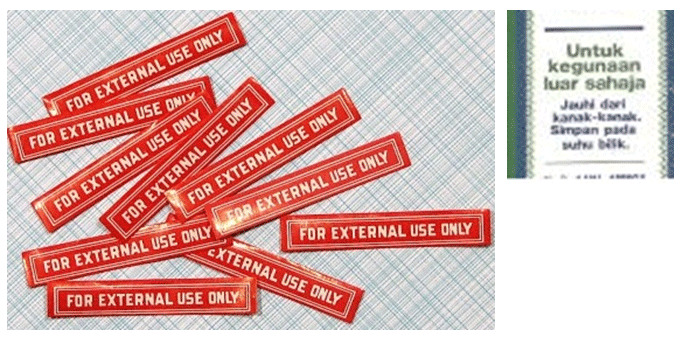 This type label must be in red colour background or written in red. In 2011, the Pharmaceutical Services Division, Ministry of Health (MOH) has introduce a price tag on every medication supplied to patients including on the medication envelope. The purpose of putting a price tag on every medication is to provide information to patients/consumers regarding the drug prices so that they will be better utilize and appreciate the provision of subsidized medicines by government so that compliance in taking these medicines increase.